Since November 2013, a number of protest groups under the leadership of the People’s Democratic Reform Council (PDRC), which represents the political views of about 20-25 percent of the population in Thailand, have been trying to topple the government of Prime Minister Yingluck Shinawatra. She assumed office after reasonably free and fair elections in July 2011 had led to a convincing victory of her Phuea Thai Party over its main competitor and second-biggest political grouping, the Democrat Party, led by incumbent PM Abhisit Vejjajiva. The gravity of the protests can be seen from the fact that, until early March 2014, 22 people have lost their lives in shootings and bombings, and more than 700 people have been injured. Thus, the PDRC’s actions certainly do not merely represent ordinary and peaceful short-term demonstrations of a set of political views that deviate from that of the majority and which they want to position more visibly in the public political discourse in order to convince more people to share it. Rather, the PDRC’s goal has been essentially to suspend the 2007 Constitution, replace the elected House of Representatives by a “people’s council” and the government by a “people’s government”. The members of these two bodies would be appointed from amongst individuals close to their own political agenda. The constitution would then be rewritten in a way acceptable to the PDRC. The majority of the Thai population simply was to be coerced into submitting to the PDRC’s wishes. This had been clear from the beginning, but became manifest when Yingluck reacted on the mass resignation of Democrat Party MPs from the House by dissolving it, calling new elections on 2 February 2014. Normally, returning the mandate to the people for them collectively to use their position as sovereign of the polity in order to determine via a majority vote who should have the right to govern them for the next four years would be seen as the democratically and constitutionally only valid way to decide the competition between political camps and their respective ideas. Yet, the PDRC could not accept this mainstream approach to constitutional representation and government, and neither could its ‘parent organization’, the Democrat Party. While the latter declared it would boycott the election altogether (which they had already done with the election of April 2006, thereby substantially contributing to the creation of a state crisis that paved the way for the military coup of September 2006), the PDRC embarked on a course of sabotaging and obstructing electoral procedures. This included the blocking of candidacy registration venues, advance voting, the formation of polling station committees, and the distribution of ballot papers, while the new set of members of the Election Commission of Thailand seemed to be less than enthusiastic in protecting the fundamental political right of the people to decide about their governors. Voting, even the setting up of polling stations and their committees, was made practically impossible in the nine Democrat-dominated provinces of southern Thailand (Thailand has 77 provinces, including Bangkok; the South does not include the three southernmost Malay-Muslim provinces). Consequently, voting went smoothly (though at a lower turnout and with more spoilt ballots and more “I do not want to vote for anybody” votes than usual) in the North, the Northeast, and Central Thailand, while Bangkok saw the closure of a number of polling stations because ballot papers could not be distributed to them (countrywide, around 11 percent of all polling stations did not work). In one instance, an hour-long gun battle in broad daylight erupted when one pro-government, and thus pro-election, group tried to evict PDRC protesters blocking a district office where the ballots were kept. In some blocked polling stations, voters trying to make their way through the protesters were harassed and physically assaulted. These actions by the PDRC aimed at making it impossible to conclude the elections, and thus forming the new House that would elect the new prime minister. After all, their key slogan was “reform before elections”. At the beginning of March, concluding the elections was still a long way off, and it remained doubtful whether it could be concluded altogether, especially in the provinces of Southern Thailand. However, preventing the conclusion of the elections has only been one element of the PDRC’s approach to undermine the Yingluck government. They have also targeted government offices and officials. The latter (including the military and the police) were asked to withdraw their loyalty to the government and join the protesters. Many government offices have forcibly been closed down by the PDRC. Prime Minister Yingluck has been unable to use the seat of the chief executive, Government House, because the protesters have blocked it (for a comparison, readers might imagine that the Republican’s Tea Party would surround the White House and not allow President Obama and his staff to work there). An initial attempt to remove the protesters by using crowd control measures, including tear gas, lead to street fighting and was unsuccessful. Moreover, the Army cautioned that it did not want to see “violence” used against the protesters. A later attempt was declared illegal by a Civil Court that argued that the Constitutional Court had declared in a previous decision that the protesters were merely using their constitutional rights of peaceful assembly. In addition, the PDRC has blocked a number of key intersections in central Bangkok. All this has been part of the PDRC’s grand “Shut Down Bangkok” plan. At the beginning, this plan was able to mobilise around 500,000 attendants, both from Bangkok and those recruited in the provinces. By the end of February, however, this number had long dwindled to around 5,000 participants in the evenings, while the sites remained virtually empty during day time. Yet, the Civil Court has prohibited the government to disperse the protests or to touch their equipment, while the existing arrest warrants for the key leaders cannot be enforced by the police because those leaders are protected by hundreds of armed bodyguards. The PDRC protests are not an isolated event. Rather, they represent the latest “moment of collective claim making” in a “stream of contention” that started a short while after Thaksin Shinawatra (the elder brother of Yingluck) had assumed the position of prime minister following the elections of January 2001 (his party was then called Thai Rak Thai—Thais love Thai, TRT). His style of governing drew a great deal of criticism from some quarters, but the voters were satisfied enough to give him an overwhelming election victory in 2005. Nevertheless, criticism persisted and finally led to mass protests organised by the People’s Alliance for Democracy (PAD) from late 2005. Despite Thaksin having earned a convincing electoral mandate just a year earlier, the protesters claimed that he had lost the legitimacy to govern. In these circles, he became to be seen as a supremely corrupt tyrant, a reincarnated Hitler, heading an “elected capitalist-absolutist regime”. Since that time, a key goal in the aforementioned quarters was to topple what they labelled the “Thaksin regime”. The military did them the favour with a coup in September 2006, followed by the dissolution of TRT by the coup-installed Constitutional Tribunal. Yet, the post-coup election in December 2007 brought yet another Thaksin-dominated party (Phalang Prachachon, People’s Power, PPP) back to power again. From May 2008, it had to live with another round of protests by the PAD, lasting 193 days that included the occupation of the Government House compound, and the blocking of Don Mueang and Suvarnabhumi Airports. The PAD protesters achieved their goal indirectly when the Constitutional Court dissolved PPP at the beginning of December 2008. This led, with some trickery, to the Democrat-led coalition government under Abhisit Vejjajiva. Pro-Thaksin voters felt betrayed, resulting in the “red-shirt” movement. Its protests in Bangkok in 2009 and 2010 were suppressed by the military, the latter instance leading to more than 90 deaths and 2000 injured. This time had come in September 2013 when the Yingluck government tried to push through a highly unpopular amnesty bill, which might have allowed Thaksin to return to Thailand without having to serve his prison term. 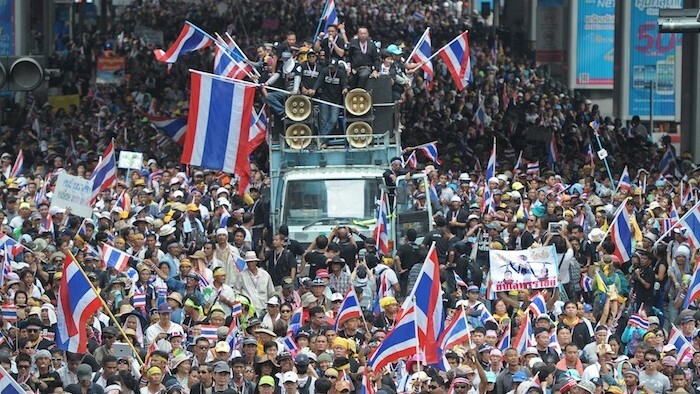 After the government had used its allies in the Senate for killing that bill, the protests against it developed into a much more serious enterprise, namely the final and entire ‘eradication of the Thaksin regime from Thai soil forever.’ It was not any longer the PAD that led the protests, but the PDRC, though many of those who had played active roles during the three PAD rounds joined the PDRC as leaders. And while the Democrat Party had remained in the background during the PAD protests, many of its most important personnel now took up key mobilization and organizing roles under the leadership of Suthep Thaugsuban, a provincial strongman from southern Surat Thani province, who had been deputy prime minister under Abhisit, and the Democrats’ main powerbroker. Yet, the key political conflict in 2014 has remained unchanged since Thaksin Shinawatra first assumed the position of prime minister thirteen years ago, at the beginning of 2001. This entire period of Thai political history, therefore, has largely been dominated by the divisive figure of Thaksin, and an end of this era does not seem to be near. While the PDRC protests are part of the long struggle against the “Thaksin regime”, this conflict, in turn, is embedded in the “dual structure” of the Thai polity, or two competing “notions of legitimacy”. The old top-down paternalist model that featured the monarchy, military, and the bureaucracy as top-layers within the ideological framework of “Nation, Religion, Monarchy” (NRM) aiming for a totalistic control of the people, who were not seen as citizens but as obedient and conformist subjects, has come under increasing pressure by a more recent competing model. This model is bottom-up, featuring equal citizens, politicians, and political parties, who act within the framework of the constitution, based on the sovereignty of the people, and acted out in a democratic and pluralist order that depends on an independently thinking and diverse citizenry. This movement from the former to the latter model has put substantial pressure on the conservative forces in the polity, both on leading political (including military and bureaucratic) actors and those citizens who keep subscribing to the first model. The PDRC, then, is to be seen as part of this conservative sector of the political order. In its protests, it has combined ultra-nationalism with ultra-royalism, and it does not accept that Thai people are equal citizens with equal rights. Rather, as part of their hatred for Thaksin, who, from their perspective, represents all things that are wrong with the rise of the second model and its institutions and personnel, they have utter contempt for the majority of voters, who have voted him and his various political parties into office again and again. And since those voters have made the “wrong” electoral choices in 2001, 2005, 2006, 2007, and 2011, the only way to stop this is to deprive them as much as possible of their right to vote. From the perspective of the protesters, the majority of people who had voted for Thaksin-dominated parties were stupid, immature, and irresponsible, and therefore could not really be considered as part of “the people”. Thus, they did not deserve to be treated as equal citizens, and their rights did not count. Importantly, these “stupid” people and their political representatives could not be entrusted with being in power during the looming succession from King Bhumipol to his successor since they were also suspected of not having the correct level of respect for Thailand’s monarchy as the highest guarantor of the country’s official national identity within the framework of “Nation, Religion, and Monarchy”. Regarding the foreseeable future, Thai politics will play out in the latent and manifest struggle between these two models of the political order. On 28 February 2014, protest leader Suthep announced that he would vacate all occupied intersections in Bangkok on 3 March 2014, and concentrate his remaining protesters at the centrally located Lumpini Park. However, the blockades of government offices and disturbances directed at the Shinawatra family’s businesses were to continue. The goal of toppling the “Thaksin regime” remains, and it is unclear whether it will be possible to conclude the elections. For these expressions, see Charles Tilly and Sidney Tarrow, Contentious Politics (Boulder, CO: Paradigm Publishers, 2007), p. 204. Knowing Thaksin, ed. by Chermsak Pinthong. Bangkok: Kho Khit Duay Ton Publishers, 2004 (in Thai). For an overview, see Pasuk Phongpaichit and Chris Baker, Thaksin Second expanded edition (Chiang Mai: Silkworm Books, 2009). On PAD protests of that time, see Oliver Pye and Wolfram Schaffar, “The Anti-Thaksin Movement in Thailand: An Analysis,” Journal of Contemporary Asia 38.1 (2008), pp. 38-61; and Michael H. Nelson, “‘People’s Sector Politics’ (Kanmueang Phak Prachachon) in Thailand: Problems of Democracy in Ousting Prime Minister Thaksin Shinawatra,” (Hong Kong: Southeast Asia Research Centre, City University of Hong Kong, 2007). For the quote, see Kasian Tejapira, “Toppling Thaksin,” New Left Review 39 (2006), pp. 5-37 (quote on 10). After the coup of 2006, this view was countered by Thongchai Winichakul, “Toppling Democracy,” Journal of Contemporary Asia 38.1 (2008), pp. 11-37. Michael H. Nelson H., “Thailand’s People’s Alliance for Democracy: From ‘New Politics’ to a ‘Real’ Political Party?” In Legitimacy Crisis and Political Conflict in Thailand, ed. by Marc Askew (Chiang Mai: Silkworm Books, 2010), pp. 119-159. Michael H. Nelson, “Thailand’s Legitimacy Conflict between the Red Shirt Protesters and the Abhisit Government: Aspects of a Complex Political Struggle,” S+F. Sicherheit und Frieden – Security and Peace 29.1 (2011), pp. 14-18. Michael H. Nelson, “‘Vote No!’ The PAD’s Decline from Powerful Movement to Political Sect?” In “Good Coup” Gone Bad: Thailand’s Political Development since Thaksin’s Downfall, ed. by Pavin Chachavalpongpun (Singapore: Institute of Southeast Asian Studies, forthcoming), p. 160. Michael H. Nelson, “Some Observations on Democracy in Thailand,” (Hong Kong: Southeast Asia Research Centre, City University of Hong Kong, 2012), Björn Dressel, “When Notions of Legitimacy Conflict: The Case of Thailand,” Politics and Policy 38 (2010), pp. 445-469, and James Stent, “Thoughts on Thailand’s Turmoil, 11 June 2010,” in Bangkok May 2010: Perspectives on a Divided Thailand, ed. by Michael J. Montesano, Pavin Chachavalpongpun and Aekapol Chongvilaivan (Singapore: Institute of Southeast Asian Studies, 2012), pp. 15-41. Dr. Michael H. Nelson is Head of the Masters of Arts Program in Southeast Asian Studies, School of Liberal Arts, Walailak University, Thasala, Nakorn Si Thammarat, Thailand. He has done research on many aspects of Thai politics for the past twenty years.